When the US Army came ashore in Normandy in 1944, nearly all of the tanks used were either M4 or M4A1 Medium Tanks. This was primarily due to the scope of Operation Overlord and an attempt to minimize the number of parts and assemblies which would be needed to keep the tanks running. Since the M4 and M4A1 shared everything except for the upper hull and some internal fittings (e.g. firewalls, bulkheads) this was a good plan and worked well in keeping the force going. Most of the tanks which came ashore with the three main armored divisions of those days – the oversize 2nd and 3rd Armored and the new organization (three tank battalions) 4th – were equipped with these tanks, as were the tank battalions assigned to infantry divisions or the independent tank battalions assigned to the army groups. 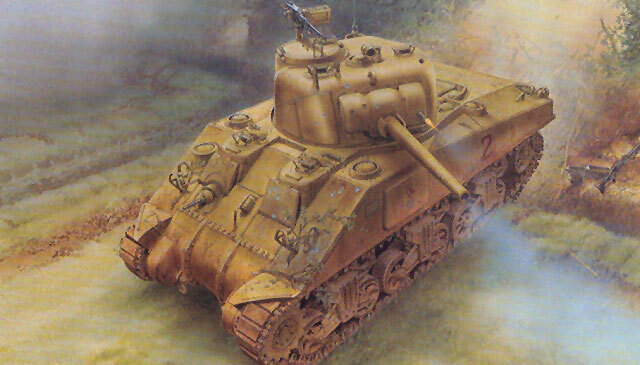 It was only later on that M4A3 series tanks began to arrive, as well as from late July 1944 on that the 76mm tanks also began to enter service. DML has now done a “straight” M4 of this period, and it is an outstanding job. It has the “low bustle” 75mm turret with an M34A1 gun mount with “ears” on the sides of the tube, six applique armor panels (turret, driver’s and radio operator’s hatch mounts, and three hull plates) and also the “five spoke” welded wheels common to these tanks. The modeler also has a choice of either “six spoke” idlers or the pressed/welded idlers (more common with this road wheel option) and either “plain” or “fancy” driver toothed rings. The kit thankfully comes with DS plastic single track runs of T51 irreversible pad rubber faced track. While they only have a thin cardboard backing, the ones in the review sample arrived straight and true with no bent teeth. The kit also sports a new-from-the-ground-up hull with a wide number of options for things like grouser compartment vents, either a cast or three-piece transmission cover, but most of the usually interchangeable detail parts (e.g. fender tips) are only brass in this kit. It does come with a very complete representation of the grillework under the air intake cover and also under the rear lip of the hull above the exhaust outlets. Some things do not change, and the kit does include the familiar M4A2/A3 basic detail sprue of tools and fittings as well. Surprisingly, with the wide variety of markings these tanks bore at that time only two options are provided in the kit: C Company, 70th Tank Battalion, Utah Beach D-Day 1944 (CANNON BALL, White 2); and 37th Tank Battalion, 4th Armored Division, Brittany 1944 (TONTO with indian head cartoon). A nice set of Cartograf decals is provided for these two options. Overall this a great kit and one which nearly completes the DML M4 family. It should be popular with Sherman fans as well as provide “mix and match” with other kits.